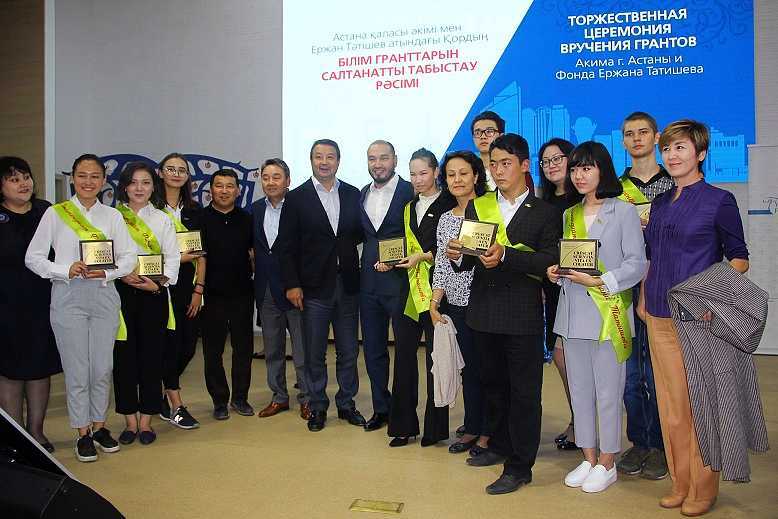 The Yerzhan Tatishev Foundation recently held a prestigious award ceremony at the Almaty Management University in Kazakhstan. As well as the mayor of Astana city, the founder of the Foundation, Yerkin Tatishev, was also present to hand out the awards. Aside from his philanthropic work, Yerkin Tatishev is CEO of the Singapore-based Kusto Group, an enterprising set of companies operating in a number of sectors, from energy to real estate. The annual student grant awards Kazakhstan’s most deserving students who aspire to be future entrepreneurs. These students, typically from low income families, would otherwise never be able to pursue a higher education. This year’s event was a particularly notable occasion, due to the attendance of Bakhyt Sultanov, the mayor of Astana, Kazakstan’s capital city. Also present at the event were the foundation’s board of trustees and many other prominent public figures. Receiving a grant from the Yerzhan Tatishev Foundation is no easy feat. The selection process is gruelling and is based on several criteria, including “academic performance, leadership skills and personal characteristics”. A strong sense of self-motivation is also a huge factor in the process. The Foundation has been active since 2005 and is split into two separate categories: the BesTirek Educational Grant Program and the Special Needs Program. BesTirek is geared towards students who display impressive leadership skills and a flair for business, while the Special Needs Program assists young people with learning difficulties. Potential recipients need to demonstrate exceptional abilities and motivation in the pursuit of a high-quality education. The recipients of this year’s BesTirek Program were Olzhas Kulakeev, Madina Shaikieva, Kamilla Alimkhanova, Dana Tasbulatova, Saltanat Kuanova, and Aigerim Karieva. The winners of grants for young people with special needs were Aktore Aitmanbet and Pavel Odintsov. All are exceptional students with outstanding potential in different fields. The grant provides full university tuition and allows the students to learn both theory and practical skills, through developing a business project. They embark on a venture under the mentorship of some of the nation’s leading businessmen, ultimately receiving a grant of 1,000,000 tenge for a start-up. Students also spend time at Babson College (USA), where they receive additional assistance in preparing these enterprises. The scholarship is all-inclusive, covering full tuition costs, accommodation, and even a monthly stipend. Students who live far from the university are also given an all-expenses paid trip home, once a year. When programs like the Tatishev Foundation extend a hand to the nation’s promising youth, the country makes major leaps forward. The grant offers the beneficiaries a bright future and brings the nation a few steps closer to prosperity. Nurturing a young aspiring group of entrepreneurs is a worthy investment in everyone’s future. Kazakhstan emerged from Soviet rule facing immense economic challenges. It is a nation undergoing major economic reforms and is working hard to transform its markets to global standards. With Kazakhstan’s huge emphasis on education, many graduates eventually go onto be future public servants and highly successful entrepreneurs. The nation is determined to develop and, according to Forbes, Kazakhstan intends to be in the “top 30 world economies by 2050”. Since its inception in 2002, the Kusto Group has prioritized education and entrepreneurship. These values are at the core of the company’s vision and philosophy. Employees are educated, trained, and treated not simply as a workforce, but as leaders. They are encouraged to think and operate like entrepreneurs. Evidently, this sentiment is reflected not just in Yerkin Tatishev’s corporate endeavors but also in his philanthropic ones. Since the Yerzhan Tatishev Foundation began implementing projects and programs in 2007, more than “720 million tenge have been spent on educational programs in support of young, talented Kazakhs and other projects.” Kazakhstan’s future, it seems, is filled with promise.